LinkedIn delighted advertisers in April with the launch of Lead Gen Forms for Sponsored Content – Following their success, LinkedIn is now updating them with a few new features. 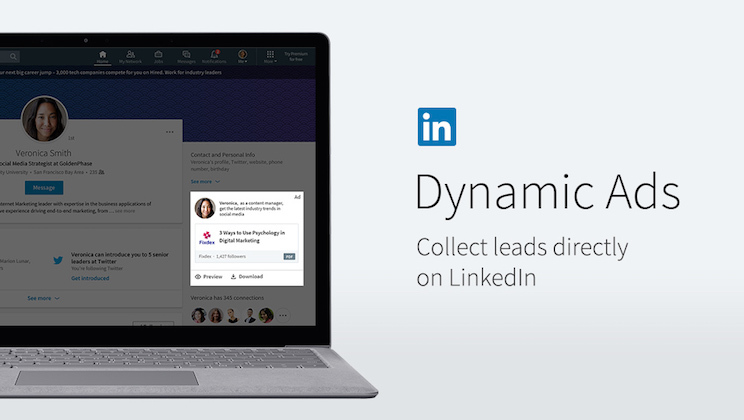 LinkedIn’s Lead Gen Forms became a big gamechanger for the platform’s ads offerings. Not only was LinkedIn able to solve the big problem of getting people to fill out forms on their mobile device, but it also led to a lower overall cost per lead using LinkedIn ads. The auto-population of lead generation forms is certainly a big help in itself, but a lower CPL is something we’ve all wanted on LinkedIn. Now, LinkedIn is making Lead Gen Forms even better, with three new features – Lead Gen Forms for Sponsored InMail, custom questions, and Lead Gen for Dynamic Ads. LinkedIn says that open rates for Sponsored inMail are “commonly above 40 percent,” however having to fill out a form on a separate landing page leads to many drop-offs. Lead Gen Forms for Sponsored InMail allow advertisers to increase conversion rates and getting more leads. LinkedIn also found that open rates were three times higher than they were for those with standard landing pages. Lead Gen Forms for Sponsored InMail will be rolling out this week. Advertisers will now also be able to add custom questions to their Lead Gen Forms. Apart from all the other fields like email, name, etc, they can add up to three custom question fields, and a blank field for open-ended questions. Custom question fields work for Sponsored InMail and Sponsored Content. In a few clicks, users can submit their information within a Dynamic Ad. Unfortunately, these ads are only available via LinkedIn account representatives. If you’re already using Lead Gen Forms, leads can be accessed in LinkedIn Campaign Manager or can be added to marketing automation solutions or CRMs through Zapier, Driftrock, Oracle Eloqua, Marketo, or Microsoft Dynamics 365. LinkedIn’s Lead Gen Forms get a well-deserved upgrade with three new features!